Are you excited for the future of mobile VR? You should be, with promising new systems like Google's Daydream getting ready to come to phones in just a few more months. And while we're definitely looking forward to checking out just how impressive the VR experience can be on Daydream-certified hardware, we're also understandably a little let down that this next era of smartphone-driven VR won't be coming to existing handsets. There are some good reasons for why that's happening, not the least which being concerns over performance with older, lesser-equipped phones. But is there no VR future at all for anything other than new, bleeding-edge hardware? Not if Microsoft Research has anything to say about it, as we learn about the innovative new FlashBack VR rendering system. FlashBack is all about making trade-offs designed to side-step the limited computational power of mobile devices. Specifically, it lowers graphics-processing requirements at the expense of storage. What that means is that FlashBack tries to pre-render as much of a scene as it can in advance, considering all the ways a user might attempt to view a virtual space and generating those 3D viewpoints. When a user later attempts to interact with this VR scene, viewing software can quickly call upon this pre-render cache, improving rendering speed up to eight times and reducing latency an impressive 15 times – and that figure's key to realistic VR. Admittedly, FlashBack isn't without its problems – the biggest of which being that this pre-render routine places some big limits on just how interactive a virtual world can be. But while it's not a perfect solution, we're curious to see for ourselves just how well it might be able to extend the VR lifespan of our existing mobile hardware. Its like too weird to understand or is it just me!!?? It won't be possible if they content itself has a lot of branches. Linear context should be no problem for this method but open world games and other similar situations won't be possible because they memory won't be big or even fast enough for this . I thought about this before but then interaction would be problematic. Simple surn based games and such could work. 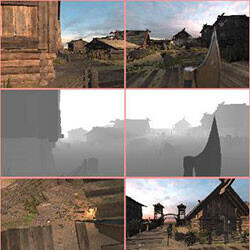 Render the scenes before hand and use control structure to choose the right one. I'm curious to see how this plays out. Also the time taken to choose the right scenes which correspond could be delayed. I'm curious to see how AR pans out. Hopefully they can make a compelling platform for business purposes.